I know, right? 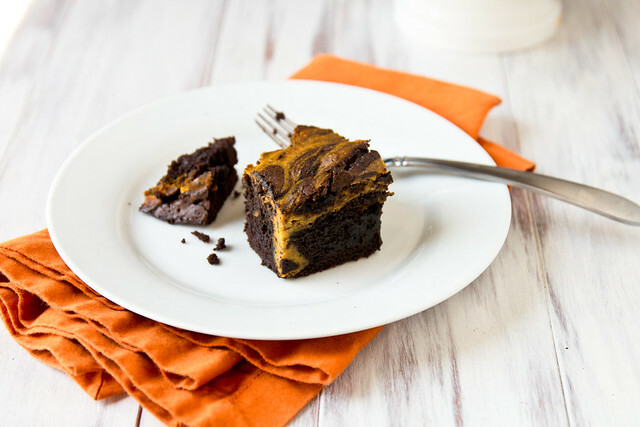 Pumpkin, cream cheese, and fall spices swirled into a moist, chocolatey brownie. Pumpkin cheesecake swirl. Oh, yes. The brownie base is actually my new favorite brownie recipe. It’s a little less fudge-like than I’d normally go for but it’s still on the dense-and-fudgey end of the spectrum. It gets its deep, chocolatey flavors from both chocolate and cocoa powder – use dutch-process or a natural-dutch blend (like Special Dark) if you can find it. They’re pretty indulgent so I tried to lighten it up just a tad by reducing the sugar, using reduced-fat cream cheese, and the Smart Balance “buttery sticks,” which are a butter-spread hybrid. I actually use those a lot for baking and I think they work great. Oh yum. 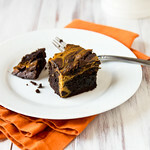 These are the perfect fall brownies! I love pumpkin in anything so I’m sure I will love these. What’s not to love? These sound and look amazing! what a perfect way to start the season 🙂 I love love brownies and I try not to look at my thigh while eating those .. but i cannot give up! This is a great twist ! I could kiss you for this. Thank you for doing all of this experimentation for us…it is so very much appreciated. Pumpkin and chocolate are 2 of my fave combinations! I am DEFINITELY putting these on my to try list!! These sound crazy yummy. Love this! Such a good idea! I love anything pumpkin, so these will definitely be tried out soon! I’ll have to make these this afternoon. These look delish! I’ve made a few different chocolate pumpkin cheesecake recipes, but these look great, I may have to put these on my list to try next! I made these brownies a while back and they are fantastic! Thanks for reminding me I need to make them again!! Wow I’m def trying these!!! They looks so chewy and delicious! Ummmm.. yes please!! Wow, these sound great! These just came out of the oven and smell DIVINE! Just made these today and tried a bit. So good! You can really taste the pumpkin, but the chocolate is very rich, i think I needed to mix it up a bit more.